I love to BBQ, but I hate to do it for just one meal! It just takes so much time setting it up and then cleaning it up afterward. 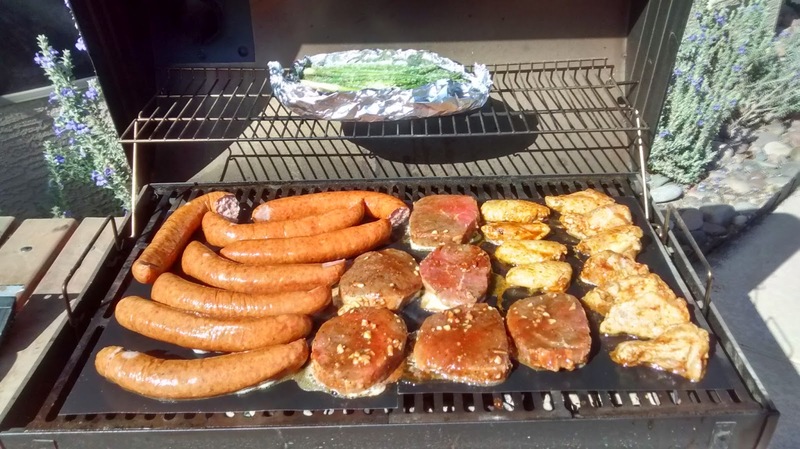 You have to not only prep the grill, but the meat as well for that yummy BBQ taste! So, when I BBQ I fill the grill and make dinner for the week. This way we can have something delicious and home cooked guaranteed every night and their is a variety since so much can be done with marinating meat! Still, that annoying scraping and scrubbing of the grill after cooking is such a drag! 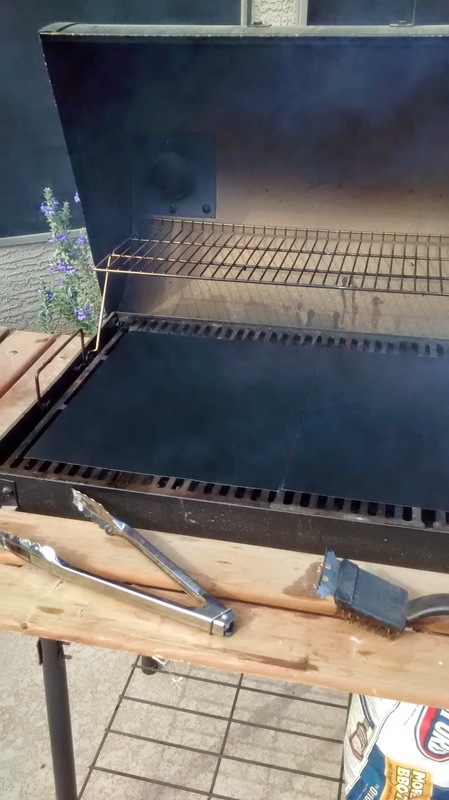 Mommy Moments with Abby's review of Yumms BBQ Baking Mat: So, I love to grill! I love that I can spend one day and have dinner for the week! I hate that I can't do so without a lot of elbow grease. So I was completely excited to check these out. Until I pulled them out. I'll be honest my first thought was these will melt to my grill effectively destroying my grill and bulk meat cooking. Still I agreed to do the review and I am looking for a solution to the scraping so I decided to take the chance. 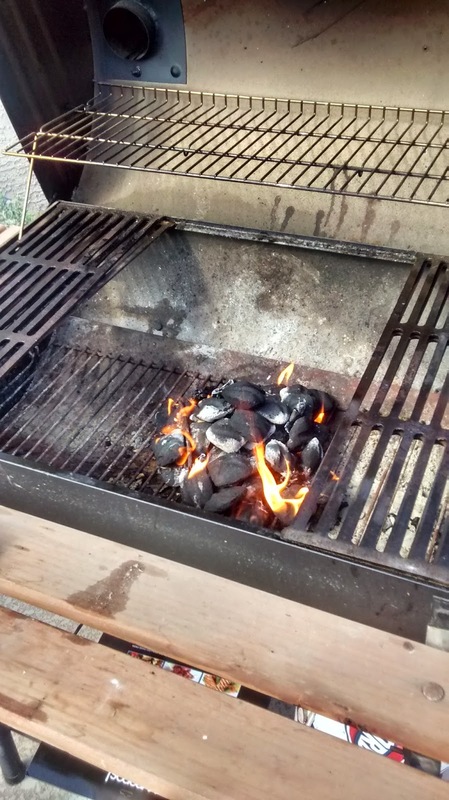 I read the instructions and made sure that the coals were no longer in flame when I put these on the grill. 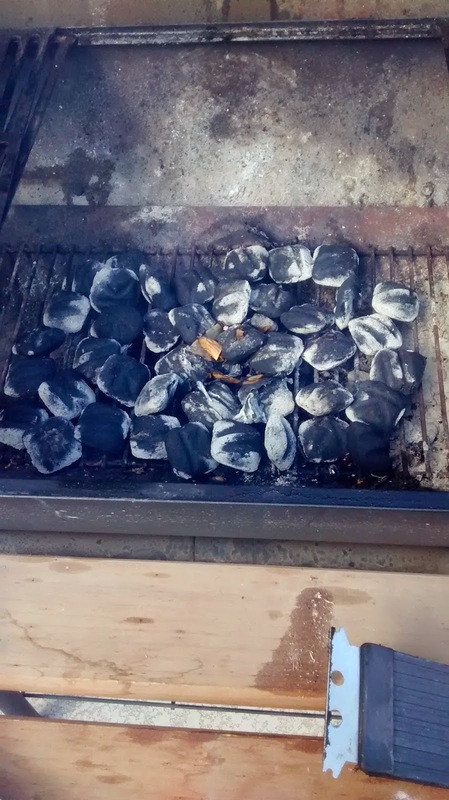 I start my grill by pyramiding the coals with paper and other burnables in the center to help get the coals burning. Once they stop burning I spread them out to make my cooking area evenly heated and avoid the overly hot spots that can cook the meat in a way that can either burn or leave raw area's in the meat. So, I waited to apply the mats until I had my hot coals spread across the bottom of the grill. I waited a few minutes and to my surprise they didn't burst into flame or melt to my grill. We were set to get some meat on and see if these mats could hold up to some marinated meats! 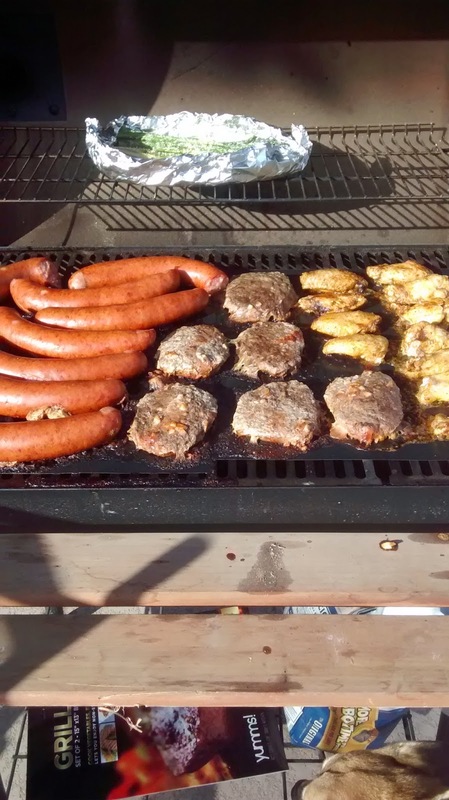 I put on our chicken wings, steaks, and some kielbasas (not marinated). The mat's maintained their structure and didn't melt to my meats. I checked on them multiple times and noticed that it held the juices off of the grill bars and the coals. This avoided flare ups that can unevenly cook meat or cause burn spots. So, the mats did what they claimed, didn't melt and kept the juices of the meats on the mats. Now for the real test! The clean up of the mats themselves. I thought for sure this was going to take a lot of elbow grease as their was a lot of burnt juices on the mats themselves. So, I did something incredibly stupid. I took some paper towels and tried to wipe up the mats right on the grill. To my surprise, even though it was hot as all get out and not recommended, this did a fair job of cleaning the mats! I let it all cool before finishing cleaning the mats, which just wiped off with some soap and a rag. These are awesome! My only complaint is that I need more to cover the top rack of the grill! Check them out for yourself! FAQ 1: Can I wash my Bamboo Cutting Boards in the Dishwasher? Answer 1: No, that will cause the boards to warp and crack. We recommend you handwash them with mild detergent. Make sure to wipe the boards gently with the grain of the bamboo, not against the grain. Then allow them to air dry before putting them away. FAQ 2: Are they Formaldehyde free? Answer 2: Yes. The glue that is used in the manufacturing of these boards is eco-friendly and food safe. FAQ 3: Are these boards eco-friendly? Answer 3: Yes. Bamboo is a renewable resource. Bamboo grows 13 feet every year. It can be easily harvested every few years without without reducing the size of the field. Furthermore, cutting bamboo will not kill it. In fact, cutting allows it to grow stronger! Bamboo has become a viable alternative to wood due to it's renewable, eco-friendly and natural anti-bacterial properties. 3 Piece Bamboo Cutting Board Set Just Bamboo by BFLFbrands. Made with Premium Bamboo these boards are hard and will not dull your knifes like traditional boards. Also they are eco friendly and naturally fight against bacteria. We have added specific care instructions on the packaging so that the boards will last a very long time and live up to their fullest potential. You are getting 3 premium boards that are light weight and very easy to clean and store.